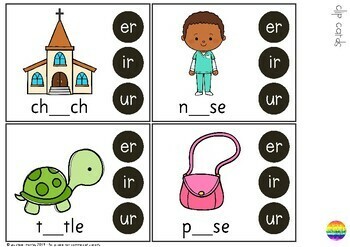 The controlled R digraphs can be difficult for young children to identify in words. Repeated exposure to vocabulary can help your students learn which spelling is correct. 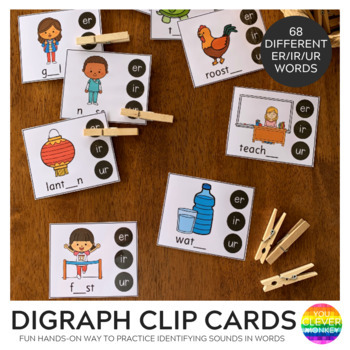 These easy-to-prep clip cards for the digraphs ER, IR and UR are the perfect addition to your literacy centers for young children learning to hear sounds into words. 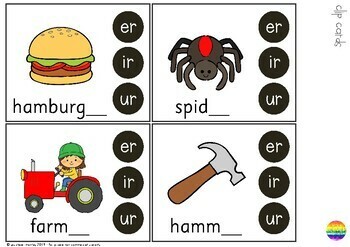 Students use their knowledge of phonics to produce and blend the sounds into a word. 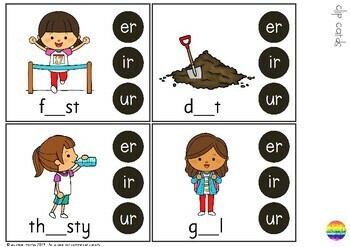 They then have to select the correct digraph to match the word pictured with a clothespin. For more teaching ideas, freebies and resources click on the ★ Follow Me ★ on my stores homepage. Please e-mail me at support@youclevermonkey.com with any questions.